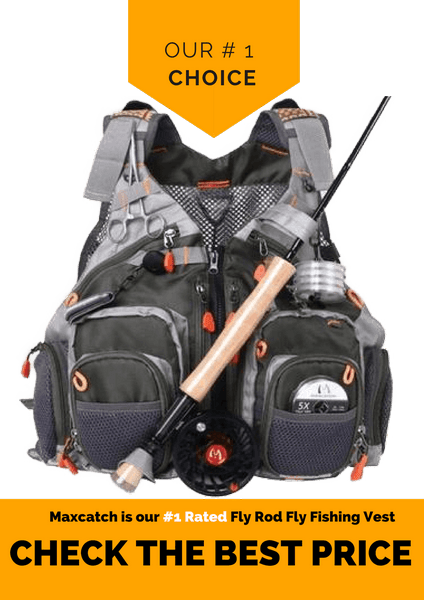 If you have par-taken the sport of fly fishing, then you need to purchase the best fly fishing vest – some individuals rarely see the use of a fishing vest, but we believe otherwise. This item offers excellent benefits to its user. For one, it allows you to carry just about everything you need in an organized and convenient manner. Before choosing one, it is vital to factor in your fishing style, fishing environment, the material it’s made of, and much more. Let us take a closer look at what makes a fishing vest a must-have item for fly fishing. Before we dive into it, let us first talk about what a fly fishing vest is. A fly fishing vest is an item that allows a fly fisher to hold just about all their fly fishing items such as tipper, weights, line cleaner, fly boxes, fly floatants, and many other essential things in a convenient and safe location. This item is handy, and a customer should choose their vest carefully. If you have never bought one before, then you have come to the right place. Here, we shall take a look at a few key considerations that you should take into account if you want to end up with the best fly fishing vest suitable to your needs. One of the key considerations is pockets. If you are new at this sport, figuring out how many numbers of pockets to go for can be downright confusing. Some vests are covered up with tons of pockets while others have fewer pockets. So, how many pockets are enough and how can you tell? Many pockets do not necessarily mean that’s the best vest. A fly fishing vest’s main goal is to help a user stay organized. Picture a vest with tons of pockets, some large, some small. It can be very confusing to figure out which pocket your favorite fly is stored in. It has zippers in some pockets – not all pockets, though. This way, you can store some items safely and securely while others can be stored in open pockets, making them easier to grab at. Aside from pockets, look for a vest that has attachment points. These loops come in handy when fishing because they give you easy access to many fishing tools. Next, you have to consider where you're at. There are different hazards if you're fishing in a lake, on the shore or deep sea fishing. You also have to plan for still being able to tie a knot in your line, hooking live or dead bait, or even threading line in a small piece of tackle. This sometimes means you might need gloves with free fingers, especially for freshwater or inshore fishing. But if you're engaged in deep sea fishing on a boat or off a large pier or jetty where you know you might catch large inshore fish like sharks or large drum fish; you have to consider protecting every part of your hands, including your fingers. If you're hunting big fish with huge leaders, you'll want gloves with heavy padding that helps you turn and lift big fish. If you're using a small leader and need to feel the action in the line as you wait for a bite, you'll want thinner gloves that have more sensitivity in them to react who how a hooked fish may fight you as you reel it in. Cotton/ polyester vests – These materials are perfect if you are fishing in cooler climates. The materials will keep you nice and warm, allowing you to stay outdoors and fish for longer. Stretch mesh – These vests are less constrictive and allow a user to move about freely. Now that you have determined what material and type suits you best, next is figuring out what length your fly fishing vest should be. Length is generally determined by the type of water you will be fishing in. Standard fly fishing vests - These models are typically long and cover most of your upper body. These vests have enough pockets and are one of the most preferred among fly fishermen. Large fly fishing vests - These products are larger and consist of more pockets than standard vests. They allow a user to carry more fishing tools, rain gear, and other camping tools. Before buying this type of product, you should always ensure that it fits you well. Chest packs - A user can opt to purchase this type as opposed to a fly fishing vest. This item is best suited when you are fishing in salt water. Chest packs are not as long as standard vests and they do not have as many pockets. If you want a product that will not weigh you down in salt water, then opt for a chest pack. You have found the perfect vest, has a perfect fit, and it suits all your fly fishing needs: The final thing to take into consideration is price. What is your budget? Are you willing to go over your set budget? When you start shopping around, you are bound to find items that are over budget, have more features that will appeal to you, but if possible, stay strong and look for a vest that fits your needs and is within your price range. Above all, comfort and fit are everything. Wearing a fly vest that is uncomfortable will turn your experience into a very miserable one. This item is my kid’s favorite fishing vest. It has tons of pockets allowing him to store and carry just about anything he wishes. Its poly-cotton material keeps a user warm even in cold weathers. The size of the fishing vests are standard with one size fits most of all, and it Comes with the adjustable strap which suits perfectly for both men and women. Fishing vest backpack comes with adjustable straps for the perfect fit. Breathable mesh design allows the air to flow freely. You can pack incredible amounts of fishing gear into the multiple pockets. High quality fishing vest that is great for the price. The adjustable suspension system and lightweight material of the Bassdash fishing vest make it perfect option for those who are planning on outdoor fishing activities. This fishing vest comes with 14 zipper pockets for carrying all your fishing gear. Kylebooker fly fishing vest a great choice that fits most anglers. The adjustable straps on the shoulder and weist make it fit your body while the breathable mesh material allows for perspiration. Kylebooker fishing vest is an excellent product and with a decent price and also comes with the rod holder strap. You can be assured of feeling great when going out fishing. It has more D rings and deeper pockets along the zipper. Great vest to store all your lures. This product comprises 16well-designed pockets that can be used to hold just about anything necessary for a fishing expenditure. The size of the fishing vest is perfect, and there are adjustable straps on the shoulder and waist to fit both men and women perfectly. Maxcatch fly fishing vest comes with a lifetime repairing, so there is no reason not to order one. Made of breathable fabric material & mesh backing to keep you cool and dry all the time. Comes with a lifetime repairing warranty. Piscifun products are always great, and this fly fishing vest backpack is another excellent choice for all-day fishing. This vest is made from durable and waterproof 210D Nylon material. The vest comes with extra pockets and a waterproof case to keep your phone safely. The construction of the fishing vest is also solid making this a great fit and excellent value for money. if you're looking for an entry-level fly fishing vest for a very big fisherman this is the fishin vest all you need. Lowpricenice vest comes with nice pockets so you can store ton of fishing gear in it. The sholders have rod holder so you can work handfree of rod. If you're looking for an economical fly fishing vest, then Lixada vest is might be a good choice for you. This vest suits for almost all average people due to webbed adjustable buckle straps. Comprises of 11, user-friendly pockets that allow you to carry just about any fly fishing tool that you need for a full day adventure. This item comes in a variety of sizes to suit just about all body types. It is made from cotton and polyester, making it one of my favorite to use especially in cooler climates. It has a mesh body, which allows for great airflow. This item has more than 6 pockets for convenient storage. Mesh lining ensures that the vest is well vented. The 11 pockets offer ample storage space. The design of vest is unique making it and excellent fit. If you're looking for a kayak fishing pfd, NRS Chinook is an excellent choice here which has multiple pockets for your tackle with an integrated fishing rod holder. The vest is adjustable and a high-quality vest that can serve you very long. With the 200 denier urethane-coated ripstop nylon and mesh lower back no other Kayak fishing PFD can match the comfort and utility the Chinook vest delivers. Vest pack it is designed perfect for seats in a fishing kayak. Autumn ridge fishing vest is of a long size and comprises of 16 easy to use and easily accessible Velcro and zipper pockets. It is very lightweight and consists of a breathable mesh. Polyester fabric with breathable material allows drying faster when wet. The vest comes with extra soft padded shoulders and keeps you comfortable on a fishing adventure. It has a standard length that most fly-fishers look for. When it comes to buying the best fly fishing vests, it is vital to take an in-depth look at the above-mentioned factors. You want to look for an item that fits all your needs, one that is durable, and also one that is fairly priced. After great consideration, Piscifun Fly Fishing Vest with 17 interior and exterior Pockets is my number one pick. This is my favorite because it contains great factors that are beneficial to all users. It has an attractive design and it dry’s fast, thanks to its fabric. This item is also affordable and will last for a very long time. Next time you are in search for a new fishing vest, refer to our key pointers is you are bound to purchase an item that is just what you need.